Professor Godric Gryffindor was a wizard of medieval times and one of the four founders of Hogwarts School of Witchcraft and Wizardry. He was good friends with Salazar Slytherin but opposed him when he later thought that they should not accept Muggle-born students at Hogwarts. It is unknown when he died. Gryffindor's birthplace became known as Godric's Hollow, in his honour. Godric Gryffindor's portrait still remains at Hogwarts. Gryffindor hailed from a moor which is now known as Godric's Hollow , a small West Country village in England. He was described as being "the best duellist of his time". Said to be one of "the four most brilliant witches and wizards of the time" , Godric Gryffindor founded Hogwarts School of Witchcraft and Wizardry in his adulthood, with friends Salazar Slytherin, Helga Hufflepuff, and Rowena Ravenclaw, though he later severed ties with Slytherin. Prized far beyond the rest. Gryffindor is said to have praised courage, determination and strength of heart above all other qualities. Indeed, he selected students for his house based upon their daring and bravery, according to the Sorting Hat. He also was the most in favour of allowing Muggle-borns into the school. The founders, however, were unsure of how they would Sort the students when they were dead. To solve this, Gryffindor took off his hat and all four of them enchanted it so that it could Sort the students long after their deaths. It was, from then on, known as the Sorting Hat. Gryffindor was initially a close friend of Salazar Slytherin, but over time their friendship deteriorated. After a number of years of working peacefully together, Slytherin eventually grew apart from his fellow founders due to his distrust of Muggle-borns, and his belief that they should not be accepted into Hogwarts. When Slytherin failed to convince Gryffindor and the others to accept his ideas, he chose to leave the school. Unbeknownst to Gryffindor, his former friend built a hidden chamber within the castle, in which he hid a basilisk that his heir would later use to try and purge the school of Muggle-borns. It is unknown how or when Gryffindor died, though he left an enduring legacy. Gryffindor left two known relics: a goblin-made sword, adorned with rubies, and the Sorting Hat. The two items share a particular bond; whenever a "true Gryffindor" needs it, the Sword will let itself be pulled out of the hat. Godric's sword was capable of acquiring powers from those it had slain and thus was imbued with venom from Harry Potter's defeat of the Basilisk, making it suitable as a tool for destroying Voldemort's Horcruxes. Albus Dumbledore used it to destroy Marvolo Gaunt's Ring, Ron Weasley used it to eliminate Salazar Slytherin's Locket, and Neville Longbottom used it to kill Nagini, the final Horcrux. Godric Gryffindor's portrait depicts him as a tall, muscular man with a lion-like mane of wavy red hair and a beard to match. He had green eyes, peach-coloured skin and is often shown with his famous sword, with which he had great skill in wielding. He has also been shown as wearing red gauntlets adorned with gold fittings. Godric Gryffindor valued courage, determination, chivalry, and strength of heart, and was described as one of the four most brilliant witches and wizards of his time. He was also tolerant and accepting of Muggle-borns, a point which brought about the end of his friendship with Salazar Slytherin. Duelling: Godric Gryffindor was said to be the greatest duellist of his time. He also possessed skill at Muggle duelling, using his sword in combat. Transfiguration: He, with the help of the other founders, transfigured the Sorting Hat into a sentient artefact to sort students after his lifetime. The name Godric is an Anglo-Saxon name in form, and can have several meanings, including, "he who rules with God" or "he who rules well". His surname is a reference to the half-lion magical beast, the Griffin, a fierce, legendary beast with the body of a lion, and the head and wings of an eagle. The Hogwarts house named after him uses a lion as its symbol. Furthermore, the last part of his surname, "dor", is similar to both the French d'or, "made from gold", "golden", which is one of the colours of his Hogwarts House, or the suffix dore, which means "gift of," in which case the meaning of "Gryffindor" would be "gift of the Gryffin." Gryffindor is also a pun on the golden gryffin, which is a lion that only has eagle wings, so it has the head and front paws of a lion, and has golden fur and feathers. Even the French for Griffindor, Griffondor is a French homophone for the actual beast, Griffon d'Or. Gryffindor was named the July 2007 "Wizard of the Month" on Rowling's website. "One of the four famous founders of Hogwarts School of Witchcraft and Wizardry, Godric Gryffindor was the most accomplished dueller of his time, an enlightened fighter against Muggle-discrimination and the first owner of the celebrated Sorting Hat." 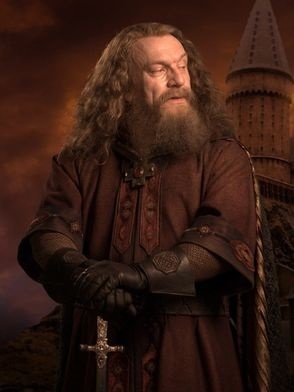 J.K. Rowling once jokingly stated that if Godric Gryffindor was still alive: he would be the giant squid that lives in Hogwarts lake, that would make him the biggest Animagus (and, quite possibly, the oldest) in the Wizarding world. At the eleventh hour of each night the squid would change back into Gryffindor, who would wander the school grounds before returning to his squid form. It should be noted that Rowling was sarcastically trying to make a point, so obviously this statement is not considered canon. Godric Gryffindor is the only founder who is not mentioned to have any descendants, although for a time it was speculated that Harry Potter himself was a descendant of Gryffindor either through James Potter possibly because James hailed from Godric's hometown, or possibly through a line of Squibs to James' wife Lily Evans. However, this theory was later debunked by J. K. Rowling in an interview. Gryffindor appears in Harry Potter and the Forbidden Journey in Universal Studios as a portrait. On the official website of The Wizarding World of Harry Potter, Godric mentions that he is proud to have Harry Potter in his house and calls him "A remarkable young man". Gryffindor's name and birthplace may allude to the Hardy Boys story "The Witchmaster's Key", which references the fictional village of Griffinmoor. ↑ Gryffindor is available in the Nintendo DS version of LEGO Harry Potter: Years 5-7. For other devices, he is available in the "Downloadable Character Pack" DLC for the game. This text is available under the GNU FDL and may have been adapted from the Wikipedia article about Godric Gryffindor (history).